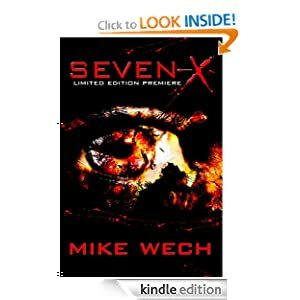 Our interview today is with Mike Wech, author of Amazon’s #1 Best Seller, SEVEN-X (rated 4.1 stars on 101 reviews). SEVEN-X is a terrifying psychological suspense thriller that follows LA Times investigative reporter into the bowels of Uphir, (a remote experimental health facility) deep in the Guadalupe Mountains, in search of a missing death row prisoner. With an opportunity to break the story, Eddie voluntarily commits himself into the asylum in hopes of finding Annette Dobson, “The SIDS Killer.” She is rumored to have had her execution faked so she could be shipped to the asylum, have an exorcism and give birth to the child the world thinks is dead. Eddie’s journals, video diary and recordings leave a trail of breadcrumbs into experimental procedures conducted on patients without their consent. As he dives deeper into his investigation, Eddie is forced to confront his own demons as an unwilling participant in the asylum’s controversial rehabilitation procedures. SEVEN-X is the first book in the SEVEN-X Trilogy, and will soon become a feature film. Mike is working with some of Hollywood’s best filmmakers to bring a unique 3D vision of SEVEN-X to the big screen. Mike Wech, explores insanity, demonic possession and behavioral science with a unique first and third person narrative that draws the reader into the asylum to personally experience Eddie’s descent into madness. Reviewers are describing SEVEN-X as a chilling, creepy, intense horror that gets under your skin and makes your rethink the unseen world around you. I started writing stories when I was about five. I used to write poems and tell stories to my friends. In school, I always liked writing and began to purse it professionally after college. I wrote plays, skits, spec television scripts and film scripts, before finally getting paid to write. Writing then became a full time job and I wrote for clients, commercially and corporately, neglecting the stories I wanted to tell. Finally, I took enough time out of my schedule and decided it was time to do my thing. I took twelve weeks off work and wrote SEVEN-X. 2. What inspired you to write SEVEN-X? I’ve wanted to write a feature film for the last seven years, but have spent all my time making other people’s films. Finally I was in a position to take a significant amount of time out of my schedule and write. I knew I needed to create a self-contained horror/thriller that was low budget and became interested in creating a story based around an asylum. My research revealed about 200 asylums built in the mid to late 1800s, a few which were still functional to shoot a film in. With the location set, I began to pray for inspiration for a story that would fit the setting. While reading the Bible, I found matching scriptures and stories about SEVEN DEMONS returning to haunt and torment the host body after an exorcism. Within minutes the whole story was in my head and I could see it happening, so I sat in my writing chair and twelve weeks later the first draft of SEVEN-X was complete. 3. What’s your book about? At it’s core SEVEN-X is an exploration of what it is that creates evil inside us. Is it chemical, physical, spiritual, demonic, toxic or mental? When Eddie Hansen, a Los Angeles Times investigative reporter gets a tip that an infamous serial killer has had her execution faked to she could be shipped off to a remote asylum for experimentation, Eddie follows her in to get the story of his life. The unorthodox experimental procedures at the asylum force Eddie to confront his own tormenting demons as well as the developing conspiracy of discovering missing death row prisoners thought to be executed. The deeper Eddie dives into his investigation, the more control he loses over himself and the story. Eddie’s descent into madness begs to be answered by the experiment he now finds himself now the victim of. 4. Tell us a little about your main character. Eddie Hansen is a gritty reporter who will go to any length to get his story. He has made a career out of going in deep to uncover the truth, but for the first time in his life, Eddie may be in over his head and he is too stubborn to recognize it. For all his professional success, Eddie’s personal life has suffered. His only real love, his eight-year-old daughter, Kennedy, has been taken from him by his ex-wife in a custody battle. The pain of his divorce, leaves Eddie unable to commit to his current girlfriend, who he has given trust of his journals and recordings as he descends into Uphir. Once inside the asylum, Eddie’s past comes to torment him and memories of his painful childhood begin to surface, bringing out the dark side of Eddie. Now in a fight for his life and sanity, Eddie must discover who he really is and what he really wants out of his life. 5. What do you enjoy the most about writing? There is no substitute for the high of creativity. I love being able to dive into a story and live it out on the page. To discover deeper parts of myself through the creation of new characters who are about to experience a life that only resides within my mind until it is given birth on the page. I love combining the reality of the world around me with the new world I am creating, and I love being able to define the rules and boundaries of this world. It allows me to see how God loves creation and how that part of him lives inside all of us as we create art, whether it is in writing, painting, music, architecture, invention, singing, building, drawing or some other form of artistic expression. We all have this innate desire to create something, and writing allows me the freedom to express this desire through the talent I was blessed with. 6. What was the hardest part about writing your book? The hardest part of writing SEVEN-X was coming out of it. I took Eddie’s journey into insanity and lived through him, feeling his despair, pain and torment. Going into such a deep, dark place was excruciating and terrifying. I scared the crap out of myself and coming back to reality was a process of having to ease in and out of living through Eddie. If you read this book alone at night, you will begin to understand where I went to write SEVEN-X. My body also had bad reactions. I almost went into cardiac arrest twice and felt like my heart was being ripped out of my chest on several occasions. I had to go to the hospital to get checked out. Thankfully my heart tests came back fine, but the stress and pain of writing this book took its toll. If it weren’t for prayer and mercy, I might not have made it through. 7. Where do you get the inspiration to write? I think inspiration is a God given gift. I am beginning to understand the difference between creativity and inspiration. Creativity is the talent; the gift of being able to develop, communicate and execute what is inspired. Webster’s definition states, inspiration is a divine influence or action on a person believed to qualify him or her to receive and communicate sacred revelation. So the only place to get something divine would be from God, or some other source one would believe to be divine. I usually don’t get the inspiration to write. I become inspired with a revelation or a story. It is then my job to create from the inspiration. I have the desire to write because I am inspired, which leads to the second part of the definition of inspiration; (b) the action or power of moving the intellect or emotions. This lower definition of the word is what I believe most people call inspiration. We are moved to write because we want to express emotion or intellect. When I’m creating, I would rather wait for the first, and move from there. 8. Who is your favorite author and why? When delving into a horror book, it is impossible not to mention Stephen King. The Shining was a great resource and a model of great writing for me to read. I had a fascination with Edgar Allen Poe’s works in high school and appreciate Clive Barker too. The works of Dante, Charles Dickens, Agatha Christie, Ray Bradbury, George Orwell, Mary Shelley, David Mamet and Sam Shepherd have all had an influence on me. No single author stands out as my favorite. 9. What do you like to do when you are not writing? What is your ultimate luxury? Writing is my ultimate luxury. As a film and TV editor I work 60-80 hours a week. Show business in Los Angeles is a life-consuming pursuit and time devourer. You always feel like you can never get enough done when working on a project. When I finally break away from it, I love cooking. I like being able to make people happy with good food. I enjoy working out, hiking, acting, sports and watching movies and TV when I have free time. And best of all is being able to go on a vacation with my wife and spend time with her away from it all. But give me free time and inspiration and writing is my passion. 10. Is there anything else you’d like to share with our readers? Thanks for reading this article and supporting SEVEN-X. As a self-published author, your reviews are important to me. Please take a few moments and post your honest thoughts on the book. It helps me define the audience, revise what needs work and strive to create the best works I can. Your reviews also help with getting the film version of SEVEN-X made as producers like to see that they have a built in audience already in place. Thanks again for your help and support. And thank you, Anthony, for responding to my query and hosting my interview on Digital Book Today. I appreciate the opportunity. 4.8 stars on 25 reviews. Do You Know Your Types of Zombies? What Kind of Books Do You Devour?